When it comes to investing for higher education, there are a few key variables that have a big impact on your final account balance: how early you start saving, how much you put away and how you allocate your investments. Selecting an asset allocation is not a once-and-done affair. Movements in the markets can throw you off your target allocation. Plus, you should think about changing to a different allocation as your child gets closer to college. Remember, if you are invested in an age-based portfolio, all rebalancing and allocation changes are done for you automatically. Asset allocation is the mix of stock, bond and short-term investments you hold in your account. Your allocation determines the risk your account is subject to, the extent of the fluctuations you see in your account balance and the amount of return your investments may generate. In general, stocks have the highest risk, volatility and potential return, while short-term reserves have the lowest. Bonds are somewhere in the middle. Because these asset classes act differently, diversifying your account—spreading your money across asset classes—can help moderate some of the risk and volatility you might face. The specific allocation that is best for you depends on the amount of time before you need the money and how much risk you are willing to handle. What should my allocation be? If you have selected an allocation relatively recently—within the last couple of years—it may not be necessary to make any changes to your target. But there are a few situations where you might need to go through the allocation decision again: if you do not remember your target allocation, if your student has aged several years since you chose an allocation or if you have found that the amount of risk you thought you could handle just is not working. 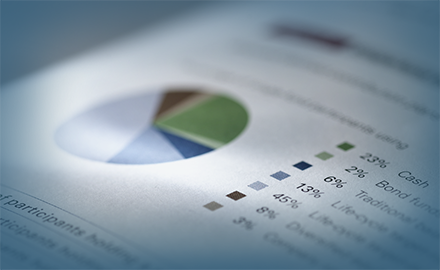 If you need help determining your asset allocation, we have just the tool for you. Do I need to make changes to align with my target? Exchange money from one asset class to another. For example, if your target is 60% stocks/40% bonds and your actual allocation is 65% stocks/35% bonds, you could exchange some money from your stock portfolio into your bond portfolio. Just be aware that IRS regulations allow you to make only 2 exchanges per calendar year in your 529 plan account. Use your contributions to buy more of one asset class. In the example above, you have too much in stocks and not enough in bonds. So you could direct all of your 529 plan account contributions to your bond portfolio until you are back in balance again. Once you have rebalanced, you are done—until next year! Keep in mind that if you would rather not spend time checking your allocation and rebalancing, we have investments that will do the work for you—age-based portfolios automatically rebalance and gradually move to more conservative (less risky) investments as your child approaches college age.